That is what it will be known as from now on. This will be a day long remembered. Instead, the curtain on Star Wars will now open with the Magic Kingdom to the tune of “When you wish upon a star” as it transitions into that galaxy far, far away. I am indifferent about Lucas selling out to Disney. Frankly, I’m over all of it. If nothing else and for no other reason, I am just glad that he has finally let it go and moved on. He will no longer be able to get his meddling hands on the Original Trilogy again and tinker with the films my generation saw when we were children. 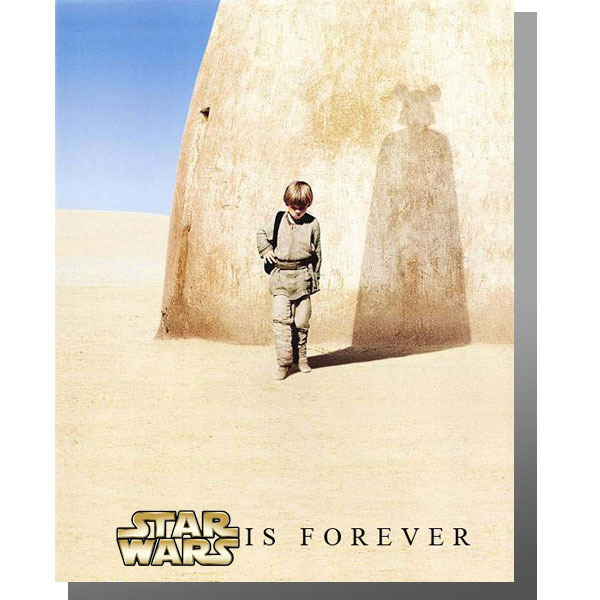 There’s a good chance that Disney will resurrect the Original Trilogy and restore them back to their unaltered theatrical versions because they know there is a demand for it and a market potential to sell more DVD’s and Blu-rays to appease the older fans as well as indoctrinate the younger generations who only grew up with the Lucas imposed Special Editions. It’s no longer Lucas’ to say which version we can or can’t watch. For that I am very hopeful and thankful. Enjoy your retirement George. I’d only wished you had done this 20 years ago. Perhaps my faith in Star Wars would still be intact and the Prequels and Special Editions wouldn’t have soured and tarnished my enthusiasm at the prospect of new Star Wars films on the horizon. The news that Episodes VII, VIII and IX are finally going to happen fills me with ambivalence. After the dismal and disappointing Prequels, I’m really not excited or hopeful at all. Granted Lucas isn’t writing or directing them which can only be a sigh of relief for most fans. The damage has already been done. Things couldn’t possibly get any worse, right? There will be stories told from a fresh new cadre of filmmakers with their love of Star Wars but it still won’t be the same as the trilogy that I grew up with. I feel that Lucas has already diminished the magic that those films held for me as a child with the infuriating Special Editions and cringe inducing Prequels and the “Disneyfied” Clone Wars cartoons that paved the way for the Mouse’s acquisition of the Star Wars brand into their mega-monopolistic IPO. Disney is a company bankrupt of any original ideas of their own, incorporating and assimilating the intellectual properties of everyone else to keep their imperialistic machinations prospering under the reign of Emperor Iger. If you thought that George Lucas and Lucasfilm were the Evil Empire, you haven’t seen anything yet. After mismanaging the potential epic science fiction franchise-in-the-making that was Edgar Rice Burrough’s John Carter, I really have no faith that Disney will act as responsible custodians and caretakers of Lucas’ franchise under the auspices of Lucas’ self-appointed chairman, Kathleen Kennedy. Ironically, there would be no Star Wars at all if it wasn’t for John Carter. Disney should have been more respectful of what they had and treated John Carter like a precursor to their premiere of Star Wars films. Unlike the misfired and mis-marketed John Carter you had better believe though that they are going to exploit Star Wars for every last penny of their $4 billion dollar investment and that means milking it even more than Lucasfilm ever did with their omnipresent merchandising and media. I really don’t want to be greeted at the gates of the Magic Kingdom by Princess Leia, Snow White, Goofy, Jar Jar Binks and Mickey Mouse. Too much Star Wars is not a good thing. It’s overkill. It diminishes and dilutes the magic of the original films as they become lost in the middle of two lackluster trilogies whose sole purpose is to profit upon the artistic integrity of the original mythos by waving it incessantly in your face. Really, what more can be told about Star Wars that we haven’t already seen again and again and again? Joe Johnston's proposed Boba Fett movie? The thing is, Boba Fett's mystique and appeal comes from being a mysterious character who appeared only briefly onscreen and had only a couple of lines of dialogue. He was cool then. The Prequels already told us too much about him that we didn't really need (or want) to know. Lucas says there is 20,000 years of stories in the Star Wars universe waiting to be told that hasn’t already been explored and beaten into the ground by the Expanded Universe in the comic books, video games, novels and cartoons. Who are the characters in this new trilogy going to be? Will we see Old Mark Hamill appearing as Old Luke Skywalker in an Obi-Wan Kenobi type role overseeing a new generation of Jedi Knights protecting the New Republic from the tyranny of a new Darth Wannabe? It’s more of the same-old-same-old. I know the lightsabers are going to be out for me on this one, and I don’t really care, but I’m sure the majority of devout fanboys out there will lap it up and willingly shell out their cash for the toys and line up to be among the first to see the new films but my enthusiasm for it all is gone. I said my goodbyes to Star Wars with the end credits of Episode III in 2005 and found closure. Like Lucas, I closed that book. That story was told. The door is opening for a new generation and new stories and endless possibilities but it’s just not my Star Wars. Lucas said Star Wars films can continue on now for a hundred years. I’ll be long dead. There comes a point where you just have to cherish the ones you love and preserve that sense of nostalgia and let it go. There’s just no stopping the juggernaut. Star Wars is forever. Yay. May the Force be with you. Always. Funny, I was wondering when we'd hear from DecDav. And I'm surprised that you're not hating this. You seem to be at least giving it a chance. I'll wait till I actually start hearing about this film before I condemn it. I'm ok with new films as long as they are good films. The Prequels were simply bad films by a film maker that should have said goodbye a long, long time ago. It is amazing how narrow minded people can be. All your whining doesn't make it seem like you're over it. Jeez, I hear less whining from my 2 year old. Look. Of course there are always concerns over a acquisition like this. But Disney has proven twice already they know what they're doing. Just look at how Marvel is doing, The Avengers should put everyone's mind to rest when it comes to Star Wars Episode VII. As far as Star Wars in the parks goes. They're already there. Been there since the 80's. Star Tours and Star Wars Weekends are HUGE draws and receive rave reviews year after year, so really, get over it. My biggest excitement over this is we'll likely finally get a land/area dedicated to A Galaxy Far Far Away! Your comments about having less of Boba Fett doesn't make sense. You don't want to know more. You had enough with the original trilogy. That's fine I suppose. However, Star Wars is a universe and it has lots of stories to tell. The biggest problem is the repetitive stories. That's why George Lucas failed with the prequels. The prequels are actually a remake of the original. I'm sure the next trilogy is more of the same, yet we hope it advances the story. The new trilogy doesn't go back. It is an entirely new beast. Why not go there? You left Star Wars behind as have I, but I have no regrets. "I feel that Lucas has already diminished the magic"
But you're the one who let it be diminished. That's the core problem with prequel haters (as in, the people who cry out things like 'Lucas destroyed my childhood! '), they can't accept things for what they are and want what they want. Get over it, and enjoy the films for what they are. If you don't like them, move on. The only person forcing you to sit there and cry is yourself. There's a bit too much cynicism in that piece for my taste, but I guess Star Wars was never as close to my heart as it was for Dave. Its largely agreed that Disney has, thus far, integrated Marvel successfully. Same can be said for Pixar. Really think about this. Lucas was going to sell to somebody, it might as well have been a company with the kind of reach and legacy that Disney has. Disney is Disney. Family entertainment, imagination, inspiration. Of all film studios on Earth, not one other can conjure the kind of feelings the Disney name can. And from Disney's point of view, this is kind of a no-brainer. What film studio wouldn't want to own Star Wars? Also, along with the Marvel purchase, this fits in line with Iger's goal to bring more young boys into Disney's reach, competing with its Princessy side of things. All in all, this aquisition makes sense. However, will the upcoming Star Wars films be any better under Disney? To that I say, it depends. Disney's feature side of things hasnt commanded anywhere near the respect it probably should. But as with Marvel, there are a tremendous amount of talented storytellers out there who have a passion for its properties. Disney need only tap the right ones, give them the resources they need to succeed, then watch what happens..... easier said than done of course, especially when billions of dollars in spending are waiting to be justified. The big question comes down to, can Disney get the right people for the job, and then let them do it? Remains to be seen. I actually think there's still potential for a good, even great, Star Wars film(s). To me, Star Wars is fantasy dressed up in a science fiction costume. There are wizards, and ghosts. Princesses and monsters. Laser blasters, and dog-people. I can't name any subsequent franchise that has achieved the kind of balance between the realms of Sci-fi and magical fantasy as Star Wars, and gotten away with it. As long as people want to see these kinds of things, there will be room for more Star Wars. Call me an optimist, but I feel a wisp of excitement when I hear Lucas talk about how generations ahead will expand and grow this creation. Will it have them same sense of Earth-changing joy that the original trilogy did? Probably not indeed. But for me, all it need do is capture the same boundless spirit of creativity and joy in its adventuring. Then I can rest easy. And allow myself to be entertained. it is a Generational thing.... my kids love the Clone Wars, and they think that the original triligoy is lame! nothing I can do or say will change their mind. My father thinking that the westerns are the greatest movies, and I think that they are lame! Star Wars might be over for you, but it is only beggining for a new generation, and that is how it should be. My children love the "Clone Wars" and think that the original triligoy is lame compared. There is nothing that I say or do to change their minds about that. The same way that my father thinks that westerns are the best movies out there and I think that they are lame and a waste of time. Star Wars is evolving for a new generation of fans, for new children. your an adult now, let the new generation have what you felt when you first watched the original trilogy. an honestly honor, Disney bankrupt of original ideas, Walt Disney himself purchased the rights to all kinds of characters, Winnie the Pooh, and Mary Poppins to name a few, and correct me if I am wrong but isn't "Wreck-it-Ralph" an original idea? I feel the perspective of the article is coming for too personal of a place and ignores the bigger picture. Lucas did not ruin your childhood. The original films are still there in their original form. If the original trilogy are as dear to you as you claim, I am sure you have them all tucked away in your home at this very minute. My question to you is, if you are over the subject, why the long rant? Clearly you are bothered by it. It's OK to admit that something is bothering you, even if it is something as unimportant as Disney buying Lucas Films. Just don't try to sound as if you aren't because your audience can clearly see the truth. And finally, George Lucas himself was already destroying the integrity of the Star Wars brand. So why be so angry at Disney? I realize you are worried that Disney will do damage to what is undoubtably the most influential sci-fi work in history, but you yourself said that it can't get any worse than what Lucas has done to the franchise. If you believe this to be true then why the sour grapes? Disney has already proven that they can acquire and nurture other companies without interfering. Pixar and Marvel come to mind. Additionally, Disney has proven time and time again that they value legacy. Iger himself brought Mortimer back to his original home within his first year as Disney's CEO. I myself am a big Star Wars fan. I did see the originals at the theaters and had all the toys. As such I was excited to hear the news that Star Wars is now part of the Disney family. In recent times Disney has proven to use care and intellect with their properties. And while they do make mistakes, John Carter of Mars, and the three too many Pirates sequels, they also make successful decisions. There is not a single entertainment company in Hollywood that has had a pristine track record at the box office. Relax, enjoy the view, and let the powers that be do their jobs. You may find yourself pleasantly surprised in the future. And if not, no worries. The Original trilogy will still be there. With our without the modern day effects, they are still as magical as they where many years ago. The logic presented by prequel-haters is unjustified. Such people claim that "the prequels are so stupid, the dialogue is lame, and they're so childish!" Using this reasoning, we can infer that nothing in the original trilogy was stupid, childish, and full of lame dialogue. Episode IV: cantina aliens playing horns and trumpets, goofy one-eyed monsters living in garbage. Episode V: "Stop. My hands are dirty. My hands are dirty too. What are you scared of?" Episode VI: Ewoks, ewoks, and more ewoks. I do agree with the article in that Disney is bankrupt when it comes to creativity. They are just going to churn out Star Wars sequels until it is no longer profitable. It is Disney we should be hating, not Lucas. Lucas said he was going to stop filming Star Wars after Episode III, and by golly, that's exactly what happened! The saga was complete as a six-part series. We don't need to see Luke Skywalker's kids do random stuff around the galaxy. I am picturing a less-entertaining version of Spy Kids. I'm not bothered anymore that star wars and indy are in disneyland. I'm looking forward to Brad Bird's take on Star Wars. I hope that rumour is true! Is this an anti-Disney rant or an anti-Lucas rant? Different generations associate with different things. I love Disneyland because I have fond memories from my childhood. I have no such emotional ties to DCA, and the park still seems lame, even after the recent upgrades. My daughter likes it, and she will probably continue to do so when she is my age. Same with Star Wars - I feel more connected to the older work, but does that make the newer work bad? As far as Disney having lost its creativity, has everyone forgotten that most of the material that Walt himself used in his movies came from outside sources? He chose to use older stories that were in the public domain so he wouldn't have to pay anyone, but he wasn't afraid to license other characters (Mary Poppins, Winne the Pooh, etc.) when the source material had potential. Star Wars has HUGE potential. Disney is just continuing to do what they have always done. That was the worst article I've read from you. Disney can't release any of the films until 2020 (and Episode IV stays with Fox indefinitely). I'm done with this site. it's too bad that the three new movie treatments for upcoming Star Wars sequels were thought up by GEORGE LUCAS and not Disney isn't it? who's bankrupt now? who couldn't stand firm in his convictions. Who traded his empire for 4 billion? hate who should be hated on. A very good article, but I don't share your pessimism. I have great hopes for the franchise now that Emperor is gone. wow..so much bitterness and words, i actually didn't even finish the dang post. I think this is the first time I've ever not liked a post on this blog. Complain a bit more and I may never come back to read this one. I personally am a fan of the Disney company and think its gonna be great when they bring out more of the Star Wars Universe. I think there are way too many critics in this world that just can't seem to get over themselves and just let things happen. Okay..I'm done now. Hope Blue Sky Disney goes back to life before this post. The main reason the prequels stunk was because there were absolutely no characters worth caring about. As a kid, I identified with, cheered for, and wept over Luke, Leia, Han and Chewbacca. THEY were the reason I saw the original films nearly 10 times each. Their absence in the prequels was sorely felt, and Lucas has never understood that. He fell in love with the new entertainment technology and thought that was all that mattered. If Disney doesn't somehow bring back Luke, Han and Company I will have zip interest in any new films. Disney doesn't handle its OWN characters well (when was the last time you saw a new film starring Mickey Mouse? He hasn't been in anything good since "Runaway Brain".) The Muppets film stunk and was unnecessary anyway. I have little hope Disney fix the problems with Star Wars, even though Lucas is now out of the picture. "wow..so much bitterness and words, i actually didn't even finish the dang post. I think this is the first time I've ever not liked a post on this blog." This article was from Decadent Dave, not Honor Hunter. Honor loves what is happening, and you can tell by what he's written. Dave is more cynical I think, not bitter, just worn down it seems by Lucas and all. But it's good that the blog has other viewpoints. Not everyone has to be so bright and cheery like Honor. "This article was from Decadent Dave, not Honor Hunter. " I realized this fact, Hogarth, as anyone who looks at who the author is would realize. I never said Honor was the one who wrote this either. I was just stating the point that "I" felt there was way more negativity towards this then is garnered. And hate to tell ya, but cynical, does usually stem from bitterness about life not ending up the way you want it. I don't think Dave needs to change what he wants to say about everything, that's his right as an author of this blog. But in the same way, I'm going to use my right to tell him I didn't even finish the article because I felt it was pointless to read more. That's all it is. And yet you feel compelled to keep posting here and criticizing Dave for being critical? Whose the more foolish? Hey Augie...only reason I keep posting is because I am called out by posters like you. I have not continued to comment on this post, but responded to comments directed toward me. I do not believe my first post is calling the kettle black. It was just a response. The last post as with this one is in conversation with people other then the original author. you might want to think about what you post before you post, sir.